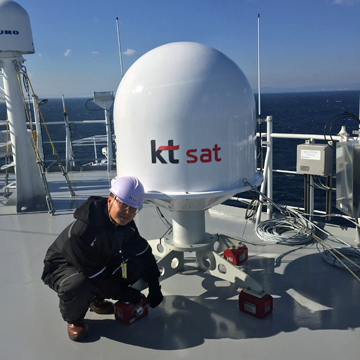 Korea's only satellite operator, KT SAT, has announced the company has succeeded with a sea trial of their Portable-MVSAT to a FSRU (Floating Storage Re-Gasification Unit) built by Hyundai Heavy Industries. This is the world's first successful demonstration service for FSRU on its test drive. Through this trial service it becomes possible to communicate large amounts of data in real time from the test vessel to inland shipyard. It also enables to create the exact high-quality work environment, which dedicates to conduct better sea trial of the ship. Portable-MVSAT is a maritime satellite broadband communication service that's specialized in short-term uses and provides KT SAT’s MVSAT (Maritime Very Small Aperture Terminal) via a mobile terminal. Portable-MVSAT has put an external antenna and communication network together. This offering may be installed and removed without any external construction as the product has a magnetic shell. This makes Portable-MVSAT highly suitable for new vessels as, formally, it was impossible to install fixed-type marine communication equipment for testing on the ships, as it is to be delivered, meaning that during the test, it was disconnected from the shipyard for one to two months. MVSAT, available through Portable-MVSAT, is a flat-rate, high-speed satellite communications service that enables faster marine satellite communications services at a much lower cost than Inmarsat. Through this, it is possible to create the same business environment as expected with land-use, such as intranet, VOIP, and real-time transmission of test-operation results. Hyundai Heavy Industries' FSRU vessel departed on January 11 equipped with the KT SAT Portable-MVSAT and has been sharing the test results in real-time through the CCTV installed on the ship during the vessel's commissioning, making it possible to perform an effective test sailing. Mr. Won-sic Hahn, CEO of KT SAT said that Portable-MVSAT is a service developed for a vessel that wants to use high-quality marine satellite communication in short term. Through the trial service, the company was able to confirm the quality of Portable-MVSAT.